Guido di Pietro (1395 ca - 1455) became Dominican Friar as Giovanni da Fiesole but is famous as Fra Angelico or Beato Angelico (Blessed Angelico). He was an Italian painter. Some of his works are hosted at the UffiziGallery. His art tried to put together the new Renaissance principles, such as the perspective, and the traditional ones of the Middle Ages. The artist was named Blessed Angelico shortly after his death, for his personality and for the profound religious emotion that transpired in his works. However, in 1982 he was beatified by the pope, who in 1984 also gave him the title of patron of the artists. 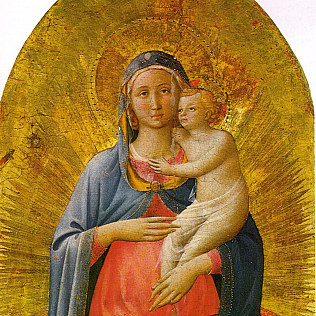 Fra Angelico studied in Florence, also as a manuscript miniaturist. The art of illumination allowed him to become very skilled in the realization of small details, as we can see in his late works. Fra Angelico’s works represent religious subjects. He painted many altarpiece, but his most famous works are the frescoes he made for the convent of San Marco in Florence. They are among the most important works of the Florentine Renaissance. The Tuscan artist also worked in Rome, where he died and was buried in 1455. At the Uffizi Gallery we can admire three paintings by Fra Angelico: the Tebaide, which is considered one of its first works; The Coronation of the Virgin; The Madonna of Pontassieve. In addition, many of his drawings are kept at the Department of Drawings and Prints.